Two Files 3 Hrs. 8 Min. 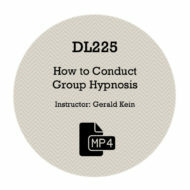 This Program Instructs The Hypnotism Practitioner How To Help The Alcoholic Become Free! Discover An Alternative To 12 Step Programs Using Hypnotism! In this “live” three session video with a client, you will see how an alcoholic of over 20 years is transformed into a life of sobriety through the use of regression and abreaction hypnosis. Although some techniques used with this client may seem somewhat aggressive, it shows powerful ways to break through the protective emotional shell of the long time alcoholic. This program is very easily adapted for any kind of substance abuse issue. This program consists of two files with over THREE HOURS of advanced, step by step, training techniques! I want you to know that I am so impressed with the two videos on alcoholism using hypnotherapy. These videos and your wonderful, caring mannerism pulled together so many effective techniques. This program is both powerful and exceptional. I have already put it into practice with great success. You have been a true inspiration and teacher to me…..indeed a master hypnotherapist. Thank you. Здравствуйте, буду признателен, если вы переведете ваши уроки на русский язык, что бы купить от первого источника.